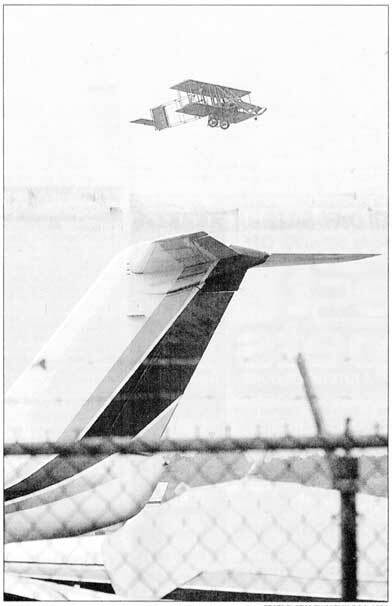 TETERBORO - It was a rickety brown sparrow of a plane parked on the runway of Teterboro Airport, not the needle-nosed jets tearing through the sky, that drew a gawking crowd. Onlookers wondered aloud Sunday whether the twin cloth-covered seats open to the elements, maple propellers, and grapefruit-sized wagon wheels would be able to lift off the tarmac. Some also gazed in disbelief at the two white-haired men who would circle the Statue of Liberty in the replica 1911 Wright "B" Flyer airplane - a recreation of Wilbur Wright's famous flight on a rainy Memorial Day weekend 94 years ago. In 1909, Wright soared from New York's Governors Island along the Hudson River to the statue and back in a flight that helped bring the Wright Brothers - who had invented the airplane in 1903 - instant fame in the United States. Dayton, Ohio-based veteran fighter pilots John H. Warlick, 78, and Bill Sloan, 81, have flown the replica almost weekly since its maiden flight in 1983. Sunday's run over the Statue of Liberty was the first of its kind since Wright's trip. The plane is similar to those first used for military runs, aside from its modern engine and radio. 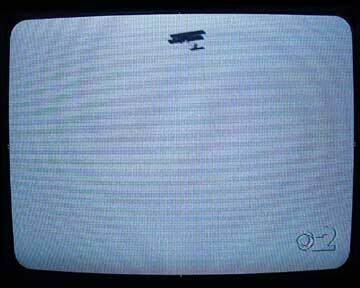 At its fastest, the 1½-ton plane chugs through the air at 60 mph, they said. 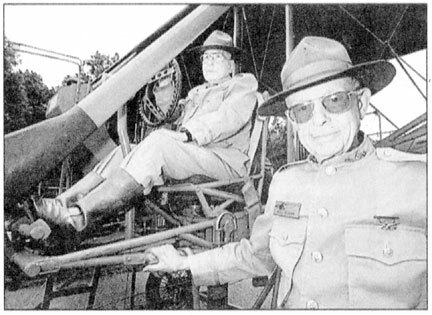 "I'd say that it's pretty ponderous to fly," said Sloan, who wore amber-colored glasses and a khaki-colored vintage Army uniform with polished brass buttons, a wide-brimmed hat, and leather boots. "That's the best way to describe it." Another member of Wright "B" Flyer Inc. - the group that spent eight years building the plane - likened flights to riding on the handlebars of a bicycle. "I'd be a little scared," said Teddy Visha, 30, an aviation technician, who circled the plane and lightly tapped on its razor-thin two-tiered aluminum wings. "But I think I'd do it." With New York and North Jersey airspace highly regulated, especially since 9/11, it took organizers weeks to secure federal permission for the flight. Earlier this month, the Federal Aviation Administration allowed a passenger jet carrying troops back from the war in Iraq to pass over the Statue of Liberty. Many onlookers watched in horror that day, thinking another terrorist attack was in progress. "We realize how nervous everyone is," said Dave Frech, program coordinator for Inventing Flight, a group that sponsored the flight to celebrate the bicentennial of Dayton, home of the Wright brothers. "The NYPD will probably be getting a lot of calls." The plane hardly looked threatening as it climbed 2,000 feet, as if it were riding a slow Macy's escalator, and quietly puttered through the air toward New York. Before taking off, Sloan smiled as he imagined people's reactions as he passed overhead. "We're usually too high to see the looks on people's faces," he said. "That's probably for the best."